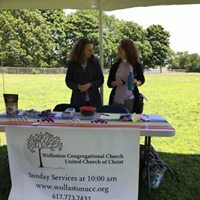 No matter who you are or where you are on life’s journey, you are welcome at Wollaston Congregational Church, United Church of Christ (UCC). We offer gluten-free options for communion and we only ever serve non-alcoholic grape juice in the communion cup. We believe that there should be no barrier for anyone coming to the communion table. In order to welcome all our guests and members, all our restrooms are single-stall and have been designated gender-neutral by our governing board.